Starwood Hotels & Resorts has a range of pretty hip brands among their hotels collection and aloft hotels are described by them as “a vision of W hotels” for its boutique and stylish design with easy going and user friendly hospitality. The sassy aloft Hotel Kuala Lumpur is an additional excitement for a fun stay and play. By mylifestylenews. First thing first, aloft Kuala Lumpur Sentral is centrally located in the business hub of the city of Kuala Lumpur where globe trotters meet, mingle, and relax. It ticks all the boxes with amenities like ballrooms, meeting rooms, lobby lounge, rooftop sky bar, as well as strong Food & Beverage outlets that cater for just what you need for either business or pleasure. As we had caught the airport train, it was reassuring to know that it stops directly under this hotel, so ease of access was a winner. The moment we step into the hotel, we cannot help but got carried away by the vibes of its bright colours ambience and décor, the space separating cubes and use of glass partitions to carve up the lobby yet still allowing you to see where everything is at a glance. The reception island is placed in the middle of the lobby sort of a round theatre with staff standing inside making a 360 degree access for enquiries and welcoming in its design. The lift quickly transports us to our floor and the corridors enroute to our room carry on the theme of bright colours art work and quirky design elements that put a smile on our face before we even enter to our room. Waiting for us on our late arrival was some playful welcome amenities to fit the vibe of the hotel – a mini steel bucket filled with chocolate dipped strawberries, mini jelly beans and mini marshmallows to send us off to sleep with some sweet dreams, a thoughtful mode to get pampered upon entering the room. Our corner room is incredibly capacious and boasts a king-size bed with humourous Malaysia cartoon art work by Lat – an infamous veteran artist Mohamed Nor Khalid above the bed head. Do spend a few seconds to read and understand the humour as it is another way of welcoming gesture by aloft Kuala Lumpur Sentral. The layout of the room is very simple with overall layout that maximizes the space for you to spread out your things without them getting in the way. The bathroom is equally wide with a clean line design and simple materials that are perfect surfaces to give a very sleek look that fits the brand so well. Space plays an important part when choosing a hotel, aloft Kuala Lumpur sentral’s eleven-foot height ceilings in the room with extra large windows creating a bright and airy environment full of natural light. You will see why when you undraw the blinds when you get up the next morning. Embrace the vibe and color in aloft Hotel Kuala Lumpur Sentral as it has quite a number of options to suit your mood and needs. Downstairs off the main lobby reception area there is the WXYZ Bar in bright pops of colour offering live music, crafted cocktails, pool tables and board games as well as flamboyant artworks that feeds off the buzz atmosphere of the lobby. Colorful art work on exhibit at the hotel lobby. On the other side of the lobby reception comes RE:FUEL, a grab and go café where you can choose from light snacks and beverages that are easy to pick-up and go. The rooftop poolside Tiki-themed Mai Bar offering open spaces indoors and outdoors is one of the current hang out for the locals especially in the evening. Should you wish to burn off some calories or soak up the tropical elements, the roof-top swimming pool is another highlights of aloft Kuala Lumpur Sentral with sensational views of the surrounding area overlooking the lush of green of the expansive and luxury real estate in the city and different perspective of skyline. The main Food & Beverage attraction is NOOK, a fabulous all day dining that is quirky in layout and design and vibrant in colour – the encased jet pod dinning section is a popular on demand seats for most diners, do request those seating while booking is made in order for you to enjoy such unique hospitality offered. Breakfast can be a make or break experience for some travelers and we were bowled over by the interior design and the buffet spread that punched above its weight in the all-day dining in NOOK. This buffet is a delight of flavours and Local Malaysia delicacies and Indian food is something we crave as we don’t usually get much in Hong Kong for genuine Malaysian food with authenticity. The local angle meant a heavy focus on noodles, rice and curries, but NOOK also offers an abundance of international options that never failed to meet expectations in quality and variety. The buffet layout is one of the most sensible ones we have come across lately, so surveying what is on offer is made simple and maneuvering around the various stations is so easy. Despite the replenishment was a bit slow at times but the wait staff were quite helpful if you opt for something cooked a la minute. The enticing Nasi Lemak, Roti Canai with dal and curry dipping are something not to be missed while travelling to Malaysia for a satisfying breakfast no doubt. Be ready to step out of your comfort zone while away from home, always do hanker for something uniquely local and different to your usual choices. Isn’t is what travelling to a foreign land to discover something new, fun and bring home the fond memories is all about? 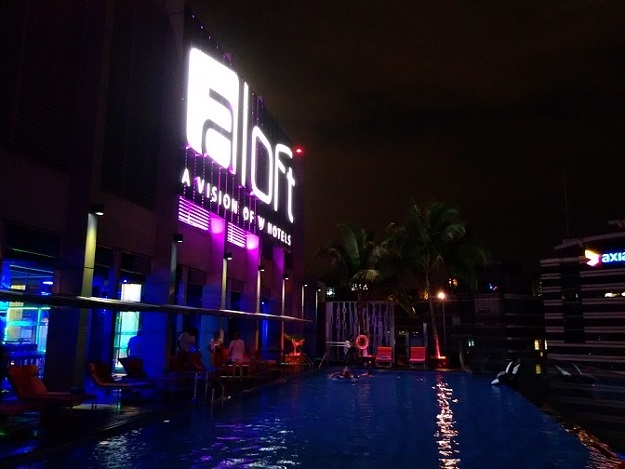 aloft Kuala Lumpur Sentral has a fresh and funky vibe yet sensible approach that caters well to the needs of young and old alike in its sleek and modern design features. No muss no fuss and to ease out the traditional way of hotel hospitality that make traveling simple. By just dropping your key card at the check-out box and you are ready to go, what’ else?